Yesterday’s wide spread down bar on the usd to cad daily chart merely reinforced once again the strong bearish market tone towards the US Dollar. This collapse has followed the failed attempts to move higher throughout June and early July. 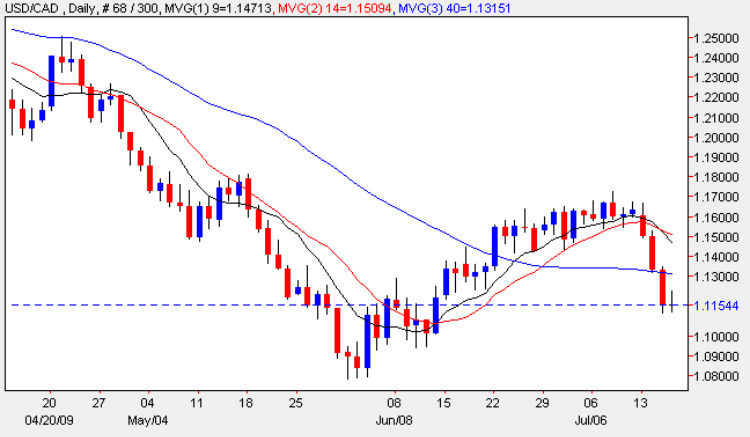 Yesterday’s candle was significant in that it closed well below the 40 day moving average and with the 9 and 14 day both pointing sharply lower a further sell off would seem inevitable with our initial target being 1.08 and a possible move towards parity once again should the current dollar weakness continue. However, given the extent of the dollar’s decline we may expect to see a small rebound today and with Core CPI for Canada tomorrow we may even see some sideways consolidation before any downward trend resumes.